Over the last decade, solar power has exploded in popularity. Not only is it an environmentally-friendly energy source, but it’s also saving money for home and business owners by reducing their utility bills. The Solar Energy Industries Association published a report showing that the solar industry doubled in size in 2016. With this exponential growth came the rise of another expanding renewable energy technology: solar batteries. 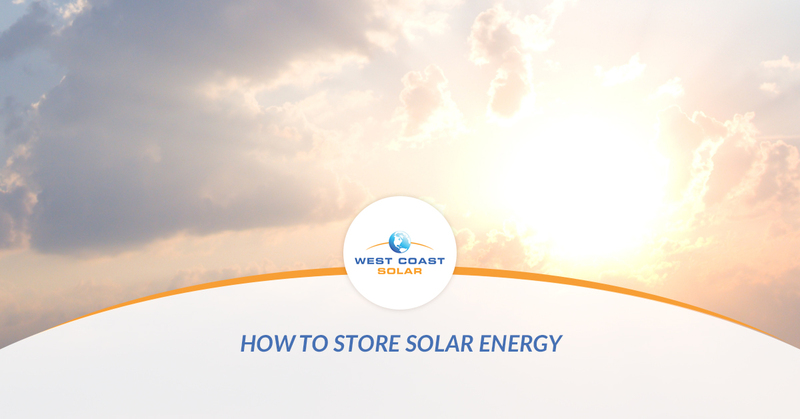 At West Coast Solar, we strive to keep solar simple, and in this post, we will discuss how to store solar energy with batteries for your property. If you’re interested in adding a battery bank to your home or business, give us a call today! Whether you are installing residential or commercial solar batteries, the concept of how a solar battery works is the same. As the solar panels collect sunlight, it gets transferred through an inverter to either the electrical panel for use or to a solar battery for storage. The solar battery, once it has stored energy, can then be used to power the home or business until the battery energy is depleted. In most cases, homes and businesses use battery banks, a collection of solar batteries that store a greater amount of energy for later. These battery banks allow you to store excess solar energy if the home or business does not use all the energy generated by your solar panels throughout the day. Why Store Solar Energy in Batteries? Solar batteries are a great addition to any solar power system. They allow for the storage and use of energy without relying on either the panels or grid to supply free energy instantaneously. Batteries offer invaluable benefits like peak hour energy use, power outage backup, and future energy use storage without the expense of traditional grid energy costs. Will Solar Batteries Work For Your Home Or Business? Your power situation determines whether an energy storage battery would work for your home or business. If you already have a solar energy system without batteries, a battery bank would be a worthwhile investment. If you want to store energy from the grid, on the other hand, you’re simply paying for the energy sooner than you actually need it, which doesn’t make sense in most situations. Finally, your home or business would benefit by adding more batteries to your bank, if you already had a complete solar system installed and functioning, to store more energy for later use. What Does The Future Of Solar Batteries Look Like? According to Greentech Media, the energy storage market grew more than 240 percent in 2015. Battery storage isn’t as prevalent as other energy technologies yet, but it is growing alongside solar power systems at an exponential rate. As renewable energy continues to grow, the energy storage sector will continue to grow with it. If you’re considering a solar battery for your home and solar system, West Coast Solar can help. We design and install solar power systems for home and business owners in over 21 counties, including San Jose, Sacramento, and the Greater Bay Area. Are you ready to discuss solar batteries with the experts in California? Give us a call today!